Lemon Zingers Summer Term 2019! Our next FREE taster session will be on MONDAY 29th April 2019 at 7.30pm. Please get in touch if you would like to join us. ​We will be rehearsing at the brand new Tong Centre, close to the main reception at Simon Langton Boys School. Email info@lemonzingers.co.uk to book a place on the next taster session, or for more information. There are no rehearsals during half term or bank holidays. For our summer concert on Saturday 13th July, we're celebrating the 50th anniversary of Woodstock, with an evening of music inspired by the era, raising funds for the Pilgrims Hospices' Blackbird Project. This will be at St. Andrew's United Reform Church, Watling Street in Canterbury. We will be joined by The Cheer Up Mollys, based in Sussex, who are a five-piece folk, acoustic, and Americana band made up of long-time friends and musical collaborators. Vocal harmonies are accompanied by guitar, ukulele, mandolin, banjo and bass, with song choices ranging from bluegrass and country. Also joining us will be close-harmony collective Acoustic Rescue Club. Tickets are available on the door for £7. Music starts at 7.30pm. Please do come along and support this amazing charity! Our next performance is 4pm-5pm, Saturday 18th May, and takes the shape of a singing workshop. We will be joining the Pilgrims Hospice in Canterbury at the Ann Robertson Centre. Participants will learn a selection of upbeat and uplifting songs to celebrate life, love and memory. No singing experience necessary. Everyone is welcome! There is a suggested donation of £3 on the door for this workshop. For more information about the rest of the day or to book onto another workshop or activity at the festival please visit their website for a comprehensive guide of what's on. 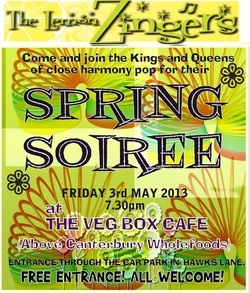 On Saturday March 23rd the Zingers joined forces with East Kent School Together's new choir - The Big Sing. This is a partnership choir that includes students from schools all over Kent. We performed at The Beaney in Canterbury at 11am. In the Autumn term we enjoyed performing at the East Kent MS Group's Christmas Cracker! This was on Friday December 7th from 7.30pm at the Seasalter Christian Centre, Faversham Road, Seasalter CT5 4AX. A full house and wonderful audience- we look forward to entertaining them again soon! On Saturday 14th July the Zingers joined forces with the New Egham Singers for a special one-off concert to raise funds for Rising Sun Domestic Violence & Abuse Service, which is a charity who for over 35 years has been supporting adults, families and children who are living with or have lived with domestic abuse. This was the third of our joint concerts where we performed with a new choir within an hour of meeting for the first time! We raised an amazing £800 for Rising Sun, at one of our favourite venues, St. Peter's Methodist Church; celebrated for it's magnificent acoustics. We also performed at our regular spot - The Beaney (People and Places), Canterbury on Saturday July 7th. This term the Zingers have also entertained the WI in Thanington Without, Kent on Tuesday 8th May. Thank you for the warm welcome and the biscuits! We will also be performing at the amazing Eastbridge Hospital in the High Street (opposite Patisserie Valerie) on Monday 4th December at 7pm. We love to perform in interesting and historic buildings, so this is definitely one from the bucket list! We will be on the ground floor, where rooms is scarce, so please come along early to listen! Many thanks to the museum for allowing us to have this opportunity. Last term the Zingers performed at 'Music & Joy', a variety night in aid of pancreatic cancer. This event is at 7.30pm on Friday 19th May 2017, at the Arden Theatre in Faversham. Tickets are available from Carter's Newsagents in Market Place, Faversham. This performance will feature a splinter group (The Lemon Zlices) of Zingers due to the restricted size of the venue. 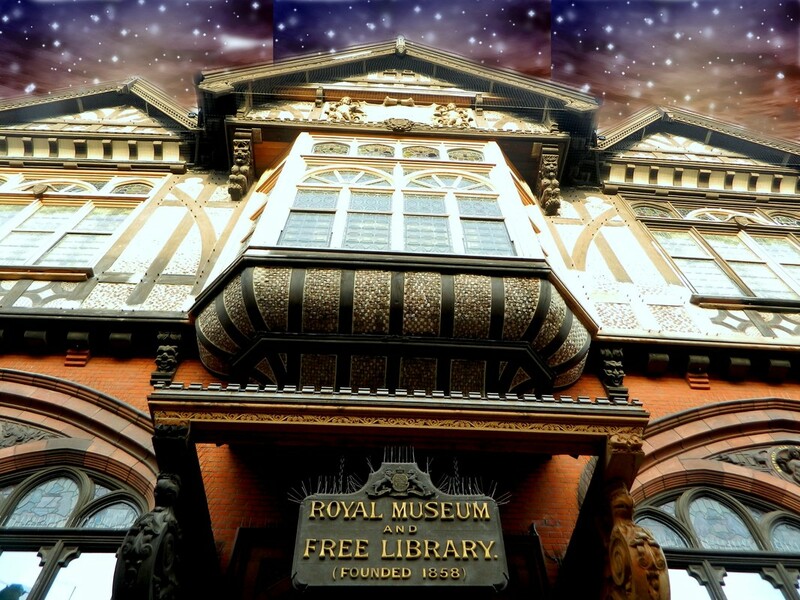 We also performed at The Beaney, Canterbury High Street, in the Explorer's Gallery on Saturday July 1st at 12pm. The performance was FREE and we were really excited to welcome a full house (museum). On Saturday 1st April the Zingers joined forces with Umeå Pop and Rock - a choir from Northern Sweden and Monday Music, a local singing for health group directed by Grenville Hancox. We were very honoured to be joined on this occasion by the choir from Sweden and welcome them to Canterbury. £850 was raised for Kelly Turner, a Dover teenager who has been diagnosed with a very rare form of cancer. She desperately needs to raise £1m to pay for an operation which can only be carried out in America. Please click here for more details. Please note: doors open at 6.45pm and the concert starts at 7pm. Tickets are £7 adults and £5 students and children, available on the door. On Sunday 17th November we will be performing at Canterbury's Westgate Hall CT1 2BT. This is a fun cultural event celebrating Asian and African cultures in Canterbury. All the money and donations go towards educating children in Karamoja, Uganda. Tickets are £10 per adult and £20 per family and food and activities are included. 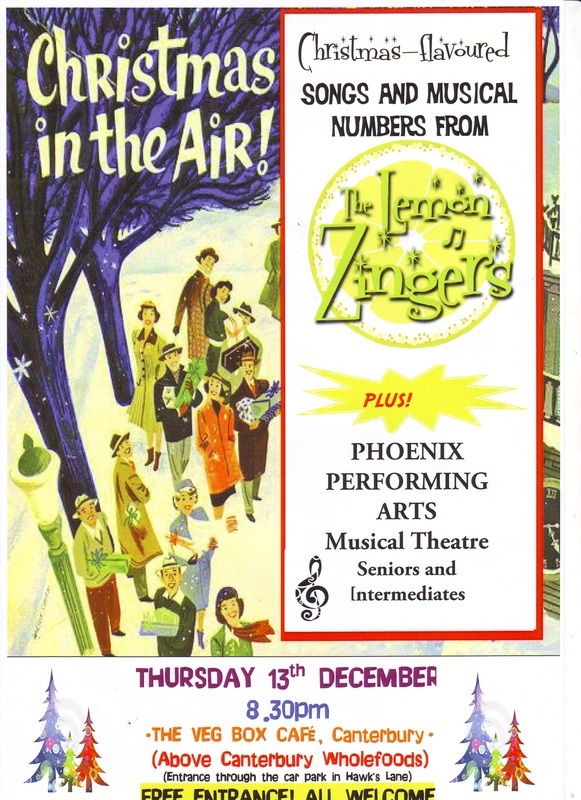 On Saturday 3rd December the Zingers host a fundraiser concert alongside Phoenix Performing Arts and St. Christopher's School at The Salvation Army Hall in Whitehorse lane, Canterbury. The aim is to raise money for Kelly Turner, a Dover teenager who has been diagnosed with a very rare form of cancer. She desperately needs to raise £1m to pay for an operation which can only be carried out in America. Please click here for more details. Please note: doors open at 6.30pm and the concert starts at 7pm. Please do come along and support our worthy charities this Christmas! St. Mary's church, Chartham in their 'Coffee & Cake' recital series. On the third Saturday morning of each month, St. Mary's hold a performance, preceded by home made coffee and cakes. In the past, recitals have included Baroque music, gospel, classical, and now it is the turn of the Lemon Zingers! Please do come along and support us. Coffee and cake from 10.30am. Entry is just £3. The Zingers were delighted to perform in Sainsburys, Canterbury on Saturday 5th December in aid of Mencap. We raised £183 in just one hour. Many thanks to everyone for supporting and donating! We are very proud to have been asked to perform at the Switch-On of Canterbury's Christmas lights on Thursday 19th November in the Longmarket. The event is from 5-7pm. The Zingers will perform some classic Christmas tunes (in their inimitable harmonies) as well as some well known uplifting pop from 6:00pm. The cast members from the Marlowe Theatre Pantomime, Snow White & the Seven Dwarfs will also be there, as well as a fabulous snow machine! Song sheets provided! Brought to you by Canterbury Connected Business Improvement District. Touring internationally since 2008, Play Me, I’m Yours is an artwork by artist Luke Jerram. More than 1400 pianos have now been installed in 49 cities across the globe, from Paris to Lima, bearing the simple invitation Play Me, I’m Yours. The project has already reached more than six million people worldwide. The Lilford Gallery is presenting Play Me, I’m Yours, as part of the Canterbury Festival, from 17-31 October 2015. 10 street pianos, decorated by local artists and community groups will be located in parks, squares and other public spaces for anyone to play and enjoy. 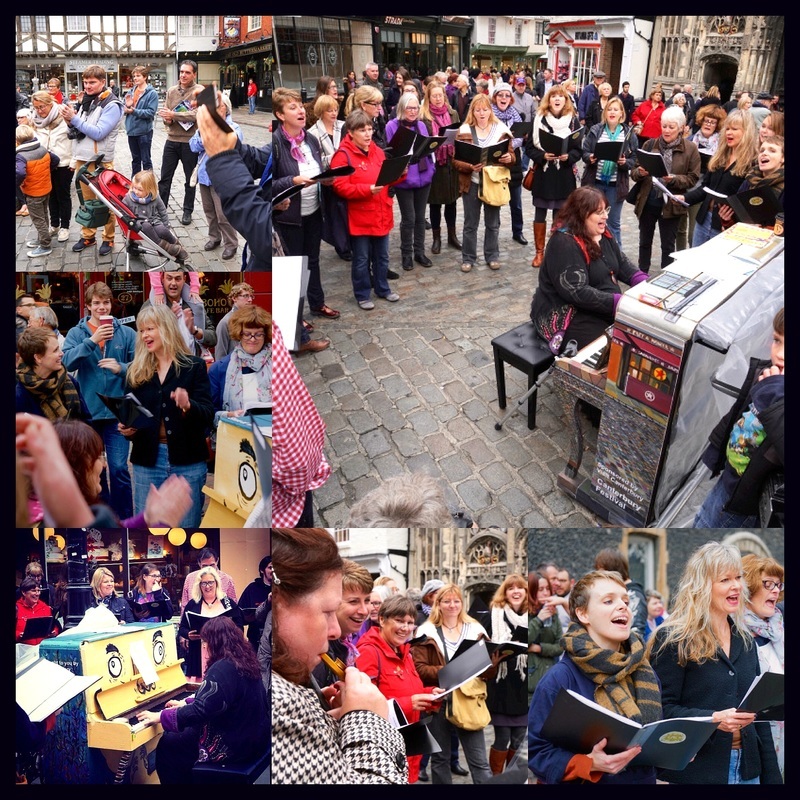 The Lemon Zingers will be joining in the fun at a piano near you, on Saturday 24th October from 11am in Canterbury city centre. Hope to see you there! 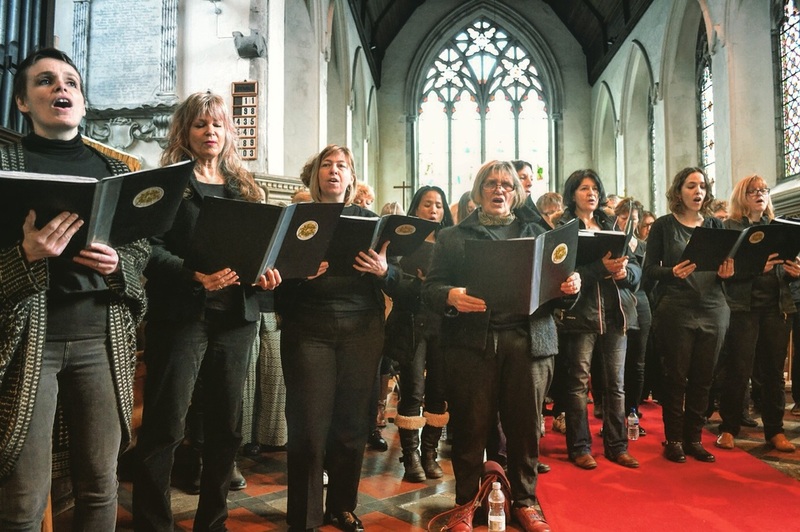 On Saturday 16th May the Zingers joined forces for the first time with the brilliant and exuberant DORSET FOR SINGING choir, who travelled all the way from Weymouth especially to raise money for the Canterbury and District Samaritans. Lemon is originally from Dorchester, Dorset and spent twelve years teaching music and singing in Weymouth. There she made many great friends, including the hugely talented musician, composer,singer and sometime Elton John tribute, Ed Hintze, who now directs Dorset for Singing. All proceeds from the concert will go to the Samaritans. We performed on Sunday 9th November at the grand opening of the Westgate Hall, Canterbury at 11:02am (as it was also Remembrance Day). The Zingers kicked off the launch of The Canterbury Festival (www.canterburyfestival.co.uk) on Saturday 18th October 2014 by performing in Whitefriars shopping centre, Canterbury after the main parade at around 1.30pm. The summer term ended on Monday 7th July with a performance and soiree at St. Christopher's School. We also performed in the school marquee on Tuesday 1st July as part of the end of year musical. The Zingers performed in Sainsbury's Canterbury (Kingsmead Road) in aid of Mencap on Saturday 14th December. Here is a video of the brilliant Flashmob which the Zingers performed in, alongside Phoenix Performing Arts, Reach Out Gospel Choir and the Christ Church University Gospel Choir. 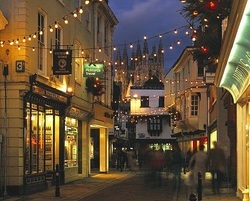 This was in aid of the Pilgrim's Hospice in Canterbury. MONDAY 1st JULY 2013 AT ST. CHRISTOPHER'S SCHOOL, CANTERBURY. The Zingers opened the show ('Good Evans'!) at 6.30pm. The marquee was packed out as there was only one performance, but as usual, the Zingers sung beautifully and were a superb start to a brilliant show by year 6. Friday May 3rd 2013 at 7.30pm. Songs! Cake! Tea and wine! Too many harmonies! FREE ENTRANCE! *Please note that entrance to the Veg Box Cafe is via the car park and fire escape in Hawk's Lane. The Lemon Zingers will be performing at The Veg Box Cafe (above Canterbury Wholefoods), Hawk's Lane, Canterbury on Thursday December 13th 2012, supported by Phoenix Performing Arts Music Theatre groups. The Christmas - flavoured performance will start at 8.30pm and is FREE! Space is limited though, so please arrive in good time. 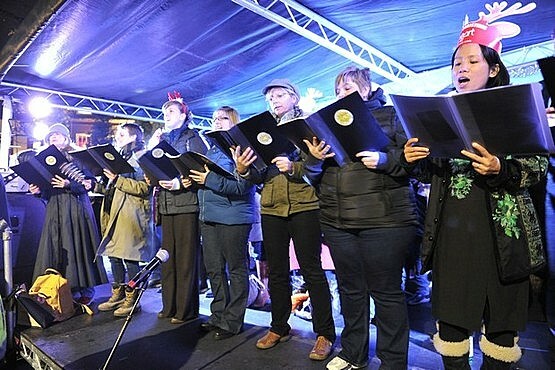 Expect twinkly retro Christmas cheese, unmistakable harmonies, mulled wine and mince pies! The Lemon Zingers will be performing at the opening of the Canterbury Festival on Saturday October 13th 2012, in Guildhall Street (next to Costa / Debenhams). The singing starts at 1.15pm- come along and listen!